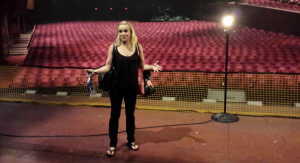 This weekend we met up with Kelly Felthous after she rocked the stage as Gloria in the National Tour of Flashdance The Musical at the Segerstrom Center for the Performing Arts. I have to say – I was looking forward to seeing Kelly (sister of ISAS teacher Charna Lopez) in the show, but I really didn't expect to love it. I was totally wrong! We had a blast. The book wasn't perfect, but I really loved several of the songs, and I was blown away by the voices on the two lead actors, Matthew Hydzik and Jillian Mueller. Kelly was great as the spunky sidekick who lost her way, and I was thrilled to see Thursday Farrar as Louise. She played Muzzie when I did Throughly Modern Millie at Stages St. Louis, and she is one of the most lovely, grounded people I've yet to work with. Kelly took us on a great backstage tour… we'll have a video ready soon. For those who have seen this movie – as you might guess this isn't the most kid friendly show. It's not totally out of line… I'd give it a PG-13. The talent was great – but feel free to email us any questions if you are on the fence about bringing one of our younger students to the show.